Al Ahly have failed in their bid to have 70,000 fans attend Saturday's African Champions League final against Moroccans Wydad Casablanca. Egypt's Ministry of Interior has refused to allow more than 50,000 fans to attend the first leg in Alexandria. Most matches in Egypt in recent years have been played behind closed doors because of security concerns. 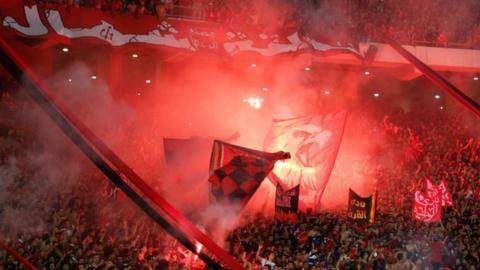 "We wanted a packed stadium but the Ministry refused," said Al Ahly official Sherin Shams Eldine. "The game is very important for us but we understand." Around 40,000 fans watched Al Ahly thump Tunisians Etoile du Sahel 6-2 on Sunday to reach the final, so qualifying as 7-4 aggregate winners. It is the second blow for the Cairo giants in a matter of days after the Confederation of African Football refused to sanction Al Ahly's request to play the final on Sunday. The final's second leg will be played on 3-5 November in Morocco, with Wydad Casablanca through to the final for the first time in six years after beating USM Alger 3-1 on aggregate. The winner of the African Champions League will represent the continent at Fifa's Club World Cup in the United Arab Emirates in December.